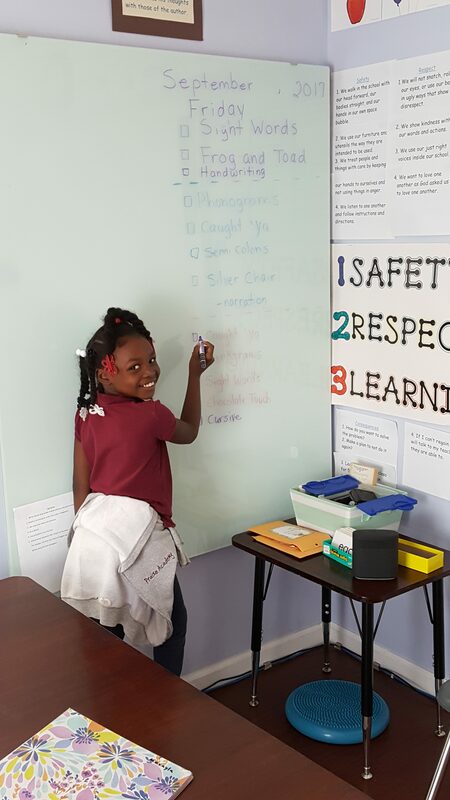 One of the third-grade girls tries out the new whiteboard. In August I left South Bend for a few weeks to help Praise Academy at Lakeside start their 2017-18 school year. Things were going well as we prepared for the school’s third year and an increase in enrollment from 13 to 18 students, but there was one problem. I’d promised the principal, Joan Pingel, that I would get some sort of dry-erase board or whiteboard for her small classroom. I hadn’t managed to do that. What should have been a simple task had turned complicated. The layout of the room left only one possible spot for the kind of whiteboard we wanted, but none of the standard sizes would fit there. I had discovered there are three types of whiteboard: melamine, porcelain and glass. Melamine is cheap but it wears out quickly and tends to get permanent shadows. Porcelain is more expensive, longer-lasting and can be magnetized, but tempered glass seemed the best choice because it can be cut to any size, it will last practically forever and you can use any type of marker. Unfortunately, the glass whiteboard that would work best for us costs $1,200, and my budget for the project was $100. The situation looked bleak. So I contacted several companies, explaining that the school is located in the poorest zip code in the state and describing the school’s mission and nonprofit status. My refrain was, “What’s the best you can do for me?” The companies basically ignored me. With school about to start, I decided I’d better buy an inexpensive whiteboard just so Joan would have something. Paul encouraged me to hit the phones again. Perhaps a local glass company could cut a piece of glass for us, drill holes for attaching it, and then temper it so it was hard enough. I wasn’t excited about making more calls, but I tried six companies in two hours. One employee suggested I call a Shreveport construction firm that works with architectural glass, encouraging me to speak to “Charles.” I dutifully called Charles and briefly described the school and our needs. I simply stated the facts. Charles said he couldn’t help, but referred me to another firm. While on the phone with that firm (they declined to help), I noticed that Charles was trying to call me. I called him back. He said he’d been thinking about it and he would “take care of it for me,” even though it wasn’t the type of glass work they typically did. I still wasn’t sure exactly what he meant, so I asked him straight out how much it would cost, and he repeated, “I can take care of the cost for you.” He even promised to deliver it himself. I was tearing up at that point and told him he was a saint and an answer to prayer. Minutes later, when I told the faculty, they broke into cheers. Before I left town I made sure I met with Charles to thank him in person. He is a delightful man, and we talked about his family, his church, Praise Academy and the People of Praise. True to his word, Charles delivered the new glass whiteboard. It had taken me 20 phone calls, hours of research and a bit of humility to “beg on behalf of the Lord,” but what was most stunning to me was that I saw close-up how the Lord’s heart is always moved by the poor. Nano, Thanks for begging for our kids. Who knows, maybe someday one of these kids will be in the POP Missionaries begging for the next generation of kids. All so we can know the Lord's concrete love for us!! Wonderful Nano! We are grateful for your willingness to beg and for Charles’ generosity! Thank you, Nano, for sharing your story! And thank you, Charles, for your generosity! And thank you,Lord Jesus, for meeting the needs of our little ones, or rather YOUR little ones!